Positive Intervention for Pupils who Struggle at School provides the resources and information primary teachers need to ensure a happy and effective school experience for all children, particularly those who are seriously struggling. 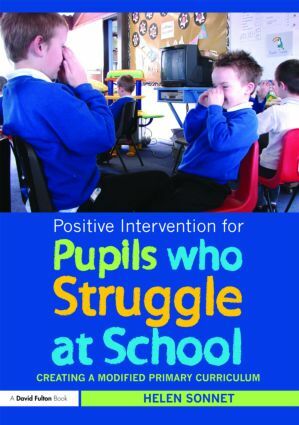 This tried and tested intervention is designed specifically for those children who have been through all the standard interventions, to no avail, and who are now in danger of being excluded. Explaining the thinking behind the suggested modified curriculum, this innovative book considers the reasons why certain children experience difficulties and looks at how this curriculum addresses their needs and enables them to develop personal, social and emotional skills. The activities are chosen to develop and enhance skills for learning, including listening, speaking, concentrating, a positive disposition and a willingness to take on new challenges. reintegrate children into their mainstream classes effectively. In line with government initiatives this important and effective intervention strategy can make the world of difference, giving teachers new, proven strategies to enable them to support children who are struggling in mainstream primary schools.